Toga Parties have become a fun ritual in modern society as a way for people to dress up, expose skin, and drink because, well, that’s what you do at a Toga Party! 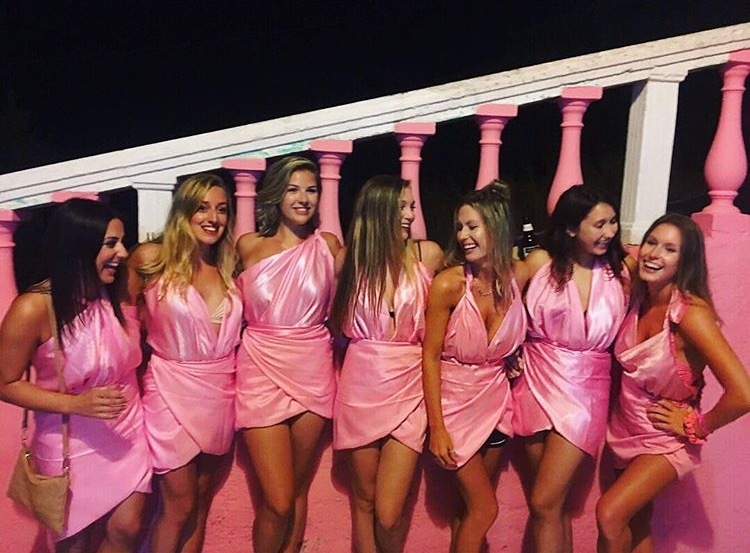 A staple for college and university fraternities and sororities, Toga Parties are an easy theme, as all that is required is a bed sheet in order to dress up and participate. So what’s so special about this celebration, and where did this ritual come from? Here’s a few facts you may not know about the Toga Party! 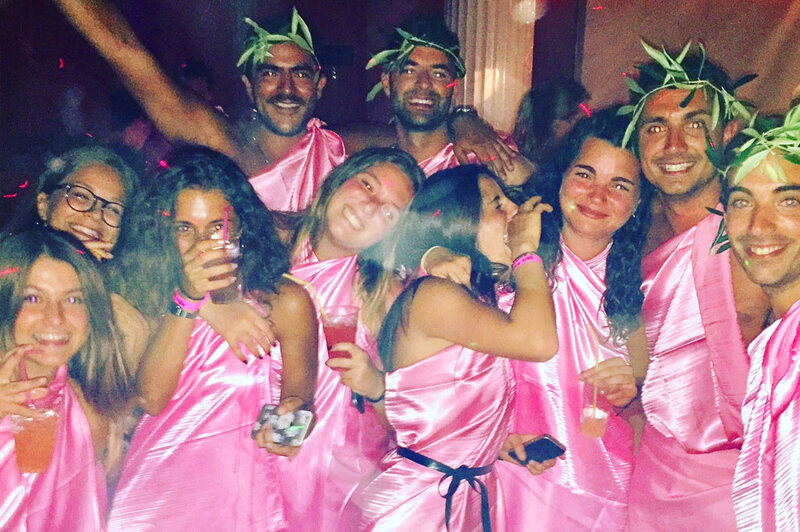 Our Toga Parties are unique as there’s not many parties where you get to wear a pink toga! Not only that, but over the decades we have been open, Dr. George and his Activities and Events Staff have added special rituals over the years. Think an ouzo circle, plates smashing, and a special choreographed performance! We sometimes even have traditional Greek Dancers. The toga has roots in garments called ‘himations’, which were lengthy cloaks worn by Etruscans and ancient Greeks. However, the more traditional looking toga we associate with the parties is in fact a Roman invention. When Roman society first became identifiable, they wore a small elongated oval of wool fabric worn over the top of a tunic or shirt, wrapped around the shoulder. President Franklin D. Roosevelt had a Caesarian “Dear Caesar” themed party for his 52nd birthday where he dressed up in a toga. On January 30, 1934, members of the “Cuff Links Gang”, a group of long time political advisers, joined the Roosevelt for the first known toga party to be held at The White House. As they celebrated in their togas, the group enjoyed a specially made fruitcake for The President’s birthday. The toga gained familiarity within popular culture as early as the historical drama starring Charlton Heston, Ben-Hur in 1959. Animal House, a hilarious cult comedy classic released in 1978, made the toga party a ritual for college fraternities. It has since made been featured as a popular frat party theme in many college comedies including The American Pie movies. Although Toga Parties are widely popular in the United States, The Guinness World Record for the largest toga party took place in Brisbane, Queensland, Australia. Organised by the University of Queensland Union and the Queensland University of Technology Student Guild took place on February 24th 2012, with 3,700 participants. Does this sound like fun? 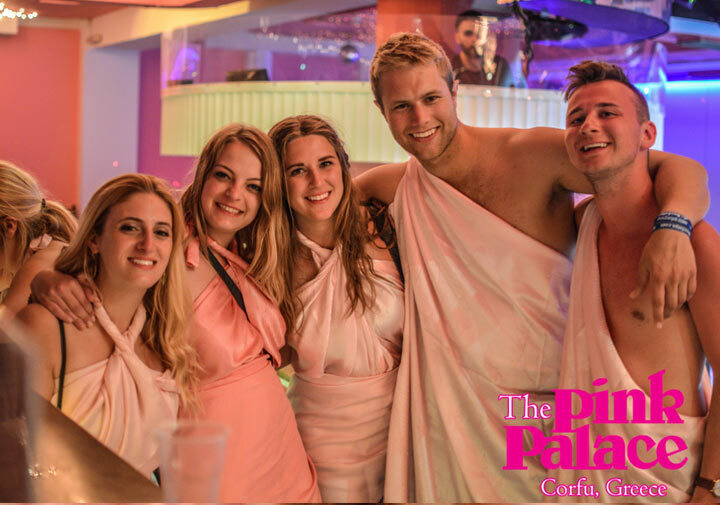 Come join the legendary Toga Parties on Agios Gordios Beach at The Pink Palace .